My 1-2-3 Cents : Any Hanging Chads? Please note, all the photos in this post come from WWE. No, I'm not talking about my partner in crime, Chad Smart. 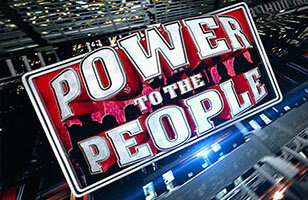 This post refers to the voting problems fans experienced Monday night during the "Power to the People" episode of Raw. The WWE has issued a statement and an apology over the technical problems they experienced. Their website says the system was so overwhelmed that some of the 697,000 votes didn't get counted. I guess they figured this out with the results of the Mason Ryan-Evan Bourne match. Apparently during the live chat 90% of the fans picked Sin Cara. Who in their right mind would have voted any other way? If you didn't vote for Sin Cara, I seriously would like to know why. You can email me privately if you want. There were other glitches that night, including the Kane-Mark Henry "match", the U.S. title match, and the 6 man tag team main event. But those outcomes don't seem to matter too much, as the storylines were able to advance because of the stipulations involved. I'm not even sure why Ryan was a choice as an opponent for Bourne. The cynical part of me wonders were there really glitches or is this lip service from the WWE? If there were legitimate issues, then I appreciate the fact that the WWE is working to make good on it. We are getting the Sin Cara-Evan Bourne match Monday night on Raw. I just hope they give these guys some time to show off what they can do in the ring. I understand that mistakes can happen, especially in the age of technology. I work in the news business and we have issues with equipment, so I understand that. As always, like us on Facebook. Follow us on Twitter. And subscribe to the greatest YouTube channel on the planet.